Inside this cardboard box is the main holding case, covered in black leatherette, gold-embossed, and shaped to form a nine-sided arena inside of which you can assemble the tiling. The lid of the case fastens with Velcro strips. 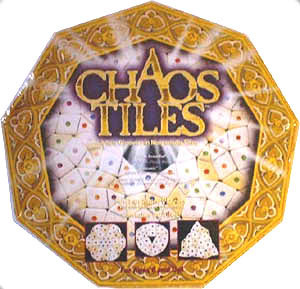 The outer box also shows some sample arrangements of the tiles to get you started. Much good thinking has gone into the design of this game. Its fascination will continue to grow.